Surrounded by his teammates who have become like brothers, Hakam Nagra sat at midfield for as long as he could, trying to fight back the tears after a 57-6 loss to West Salem on Friday, Oct. 27, thinking he had played his final home game at McNary. But thanks to a top 16 finish in the final OSAA power rankings, Nagra and McNary’s other 22 seniors will get another shot to go out at home as winners when the Celtics, No. 14, host No. 19 Grants Pass on Friday, Nov. 3 in the first round of the state playoffs. McNary and Grants Pass, both 6-3, have similar resumes. Grants Pass finished third in the Southwest Conference behind two of the top 10 teams in the state, falling to No. 5 South Medford 40-21 and No. 7 Sheldon 62-20. The Cavemen’s other loss came to Sprague, 54-27. McNary head coach Jeff Auvinen and Nagra both compared Grants Pass to McMinnville, who came from behind to defeat the Celtics 39-35 in the final minute on Oct. 6. “Their linebackers play close,” Nagra said of Grants Pass. Grants Pass is led on offense by junior quarterback Blain Hobbs, 6-foot-6-inch senior wide receiver Tayler Phillips and three senior running backs—Vincent Washington, Richie England and Teigan Jokumsen. “They’re not mind-boggling good,” Auvinen said. “They do everything well. They’re well coached. Their margin of victory is probably a little bit more dominant than their games are. They seem to win games by three touchdowns that are pretty close. That tells me they’re making plays when they need to. McNary is hosting a playoff game for the first time since 2013 when the Celtics defeated Roseburg in the first round, which is also the last time McNary won a playoff game. The Celtics were the 14 seed then as well. 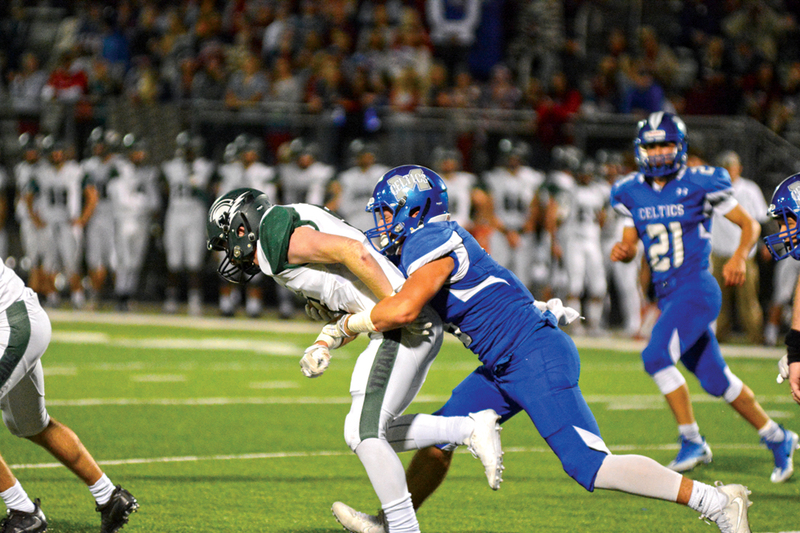 While McNary is undefeated on the road this season, the Celtics are 1-3 at home with the only win coming against North Salem to open the season. “Maybe sometimes people get too amped with everyone here to watch us,” Nagra said of the team struggling at home.